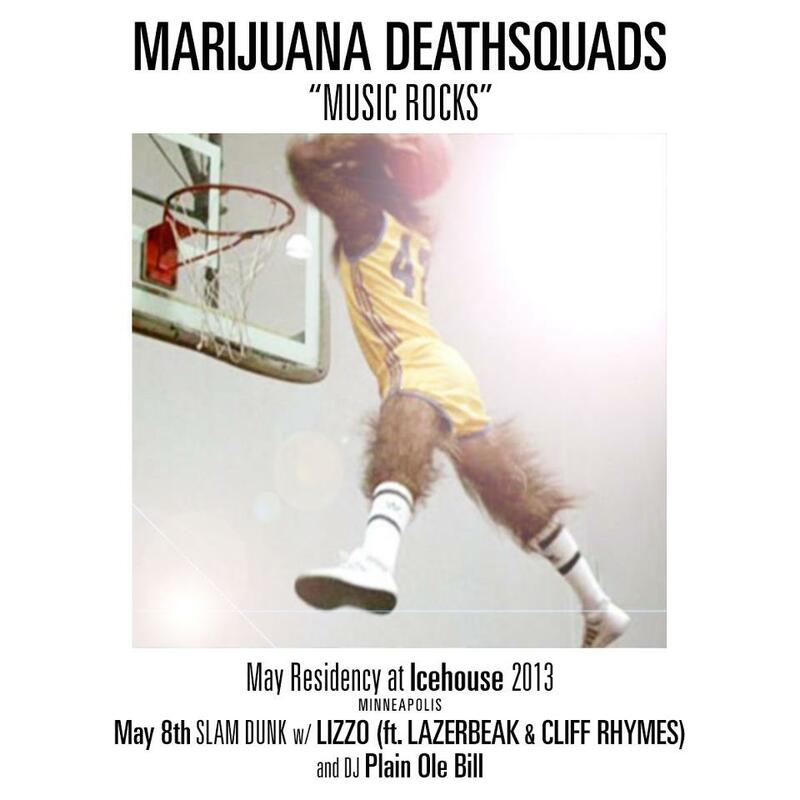 The 2nd night of a 5 night Marijuana Deathsquads residency at Iceshouse was a who's-who of local Minnesota music, and I didn't even know who everyone was. The Icehouse Twitter said the show would kick off at 10ish. In reality it was almost 11:30. Lizzo (ft Cliff Rhymes and Lazerbeak) blazed through a quick and energetic 30 minute set called LIZZOBANGERS. And bang, it did. 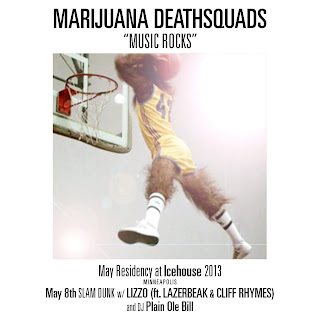 Next up, the main event, Marijuana Deathsquads performing something dubbed SLAM DUNK. Although their equipment had been setup the whole time, and Lizzo finished before midnight, MDS didn't start until after midnight. But hey, who needs sleep on a Wednesday night. The set starts out with a video of Dee Brown's Pump-Up Slam Dunk, but just the part of him pumping up his shoes, over and over and over. Then the "Oh!" from EMF's "Unbelievable" starts to get mixed in, timed with video of a different NBA player slam dunking. Finally the pair of drummers started and everyone else joined in. Slam dunk, I get it now. This wasn't the typical MDS show though, this time around all the vocals were done by a rotating cast of MCs. Two at a time, they would take the stage, rap, and get the MDS remix treatment in the process all while video rolled of well timed slam dunks. The cast of MCs included Lizzo, Sophia Eris, Mike Mictlan, POS, Manchita, Cliff Rhymes and Spyder Baby, and that was only half of them. They carried this through for the next hour and never once let up. I thought previous MDS shows were a sight to see, but this one tops them all. There are still 3 more shows this month, ending with the debut of their two new EP's "Music Rocks 1 and 2".